The Gambia is in the unusual position in Africa of having only one neighbour - the country of Senegal. To the east of Senegal is Mali, and to the south are the attractions of Guinea-Bissau. Travel between The Gambia and Senegal is relatively easy, with domestic flights and minibuses regularly connecting the two countries and their respective attractions. Flights from Senegal's Dakar to Guinea-Bissau and Mali also operate, making this the best way to travel around the region, unless you have plenty of time and patience to travel overland. Like many West African cities Mali's capital, Bamako, is a lively bustling place that you certainly don't visit for peace and quiet - instead, you go there to soak up the atmosphere. 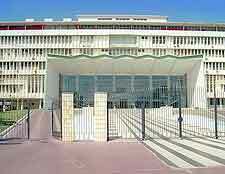 Bamako has several excellent museums, such as the Mali National Museum, the Bamako Regional Museum and the Muso Kunda Museum. 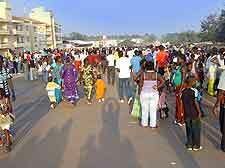 Other attractions in Bamako include a zoo, botanical gardens, mosque, the rock paintings of Point G Hill and, of course, a vibrant market and craft scene. Senegal completely surrounds The Gambia, so it makes sense to spend at least a day trip to explore this fascinating country. The nearby capital city of Dakar offers plenty in the way of urban entertainment, including museums and art galleries, restaurants and lively nightclubs. For those who are more intent on relaxing somewhere quieter, Senegal also has large areas of clean white sand. 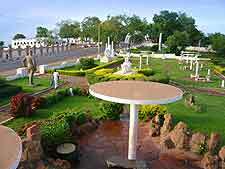 Popular coastal resorts include Toubakouta and Missirah just to the north of Banjul and Kafountine to the south. Whilst not bordering directly onto The Gambia, Guinea-Bissau is close enough for adventurous travellers in the region to consider adding it to their itineraries. 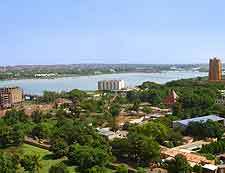 The capital city, Bissau, is a decidely more relaxing experience than Senegal's Dakar or The Gambia's Banjul. A stroll through the city's colonial old town is Bissau's main attraction. Elsewhere in Guinea-Bissau, wildlife-lovers can head for the Arquipélago dos Bijagós Bird Reserve.